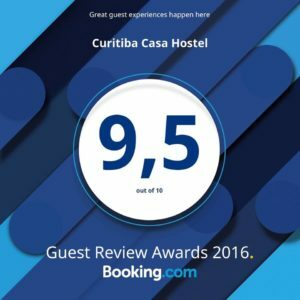 Curitiba Casa Hostel is a welcoming place, in a great location, close to the Botanical Garden of Curitiba, where you’ll have the oportunity to meet other trevelers, share experiences, rest and have fun. Now you know where to stay in Curitiba! Our staff is available 24h to give you the information you need or just for a nice chat, for you to feel at home in Curitiba Casa Hostel!